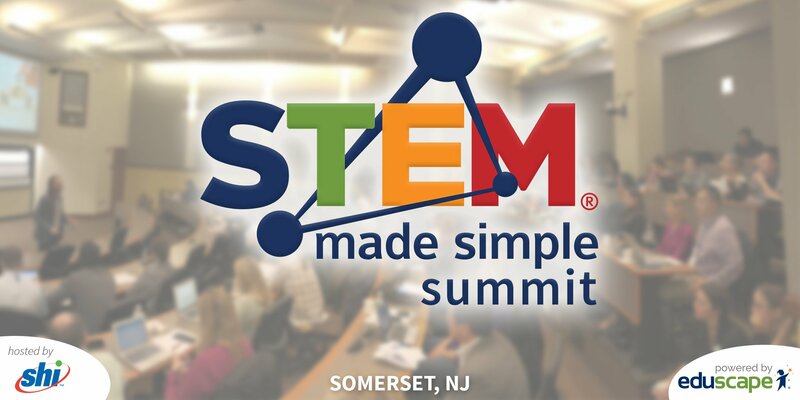 Eduscape will be holding the STEM Made Simple Summit hosted by SHI on May 22nd at the SHI Executive Center in Somerset, NJ. Download the flyer. Over the past five years, STEM education has undergone many iterations. Beginning with enhancements to the acronym itself; we have gone from STEM to STEAM to STREAM, and just to confuse matters even more, we started adding “Makerspace” to the equation. STEM is much more than the subjects represented by the letters, it is an integrated approach that uses project-based learning to enable students to understand the relevancy of their learning to the world around them. So how do we make this happen? How does a school or district implement a STEM program that aligns across the curriculum? The opening session will be delivered by Dr. Christopher Caton, Director of Curriculum & Instruction for the Moon Area School District. Dr. Caton will share how his district’s “STEAM Engines” program is empowering teachers to be the human engines of change, driving their students to an innovative learning experience. Dr. Caton has recently completed his doctorate in Administrative Leadership at Point Park University. Before joining Moon Area School District four year ago, Dr. Caton served as Coordinator for Curriculum and Literacy at the Allegheny Intermediate Unit where he also the mentor for all instructional coaches across Allegheny County through the Pennsylvania Institute of Instructional Coaching (PIIC). He has been a faculty member at Slippery Rock University and at Robert Morris University. He began his teaching career at the Butler Area School District, where he taught English. After earning his master’s degree, he served as a reading specialist and instructional coach for the district. He has spoken at both state and national conferences focusing on instructional practices, literacy, and curriculum development. He served as the lead writer for the development of a model curriculum in English language arts at the middle school level for the Pennsylvania Department of Education, and has developed presentations and tools for teacher training across Pennsylvania. Superintendents, Associate Superintendents, Directors of Curriculum, Principals, Library Media Specialists, STEM Coordinators, Special Education Teachers, and Teachers who want to integrate STEM. Participants will have the opportunity to try out the latest and best-in-class STEM tools.